Cann is a large ruin west of Highcross containing heretics and hungers (quest-related). It contains five zones: Cann, The Great Hall, Cann, Amphitheater, Cann, Halls of Tranquility, Cann, Arena, and Cann, Arena Substratum. Initially used by a group of idealistic Bliss residents to perform the Elaborate Spectacle, an event meant to cause love and shared pleasure between a bunch of captives, the ancient ruin of Cann turned into a scene of utter violence. While the involuntary participants were provided with soft silk, food and wine, their unexplained imprisonment developed bloodthirst instead of love, and they ended up slaughtering each other in the Arena. This ruin contains 21 Flame Stalk plants, 17 Screaming Maw plants, and 39 Root Stalk plants. 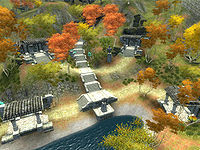 For more information on past events, see the Lore article. 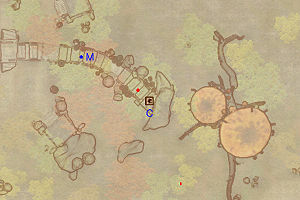 This location's map marker (M on map) is named Cann. The entrance door is ESE of the marker, 110 feet away. The first zone is quite easy to navigate although most enemies are grouped together. At the first intersection ignore the root tunnel and head north, open the doors and loot the Madness Ore deposit at M while avoiding fire from two hunger statue traps (T). 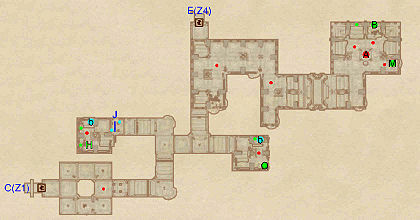 Hug the eastern wall and attack the three enemies in the next room, thus minimizing the chance that the enemy near door D will join in. You can now chose whether to enter Cann, Halls of Tranquility through door D or Cann, Amphitheater through door C. Proceeding to the amphitheater is recommended as you explore the Halls of Tranquility later on. 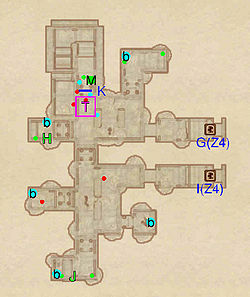 Like the first zone, this one is also relatively linear: simply make your way from door C to door E to Cann, Arena. 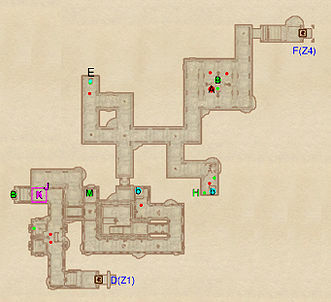 At the first intersection, head north and press the push block nearby (cyan dot on map) to open gate J and access a small room containing a bedroll (b), a wide variety of alchemical equipment and ingredients, a minor loot chest and an enemy. Head back out and proceed to the west until you arrive in a room with another bedroll (b) and Salonia Viria's skull for the Ghosts of the Hill of Suicides quest (Q); both guarded by an enemy. 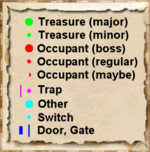 Backtrack to the intersection and head north towards door E. Before you leave this zone, take a right to access a room with a boss chest (B) and a Madness Ore deposit (M) guarded by three enemies, including a boss-level Heretic (A). 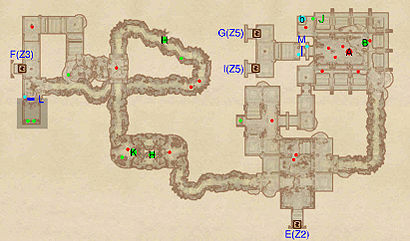 This zone is fairly straightforward, especially when you approach it on your way back from Cann, Arena through door F. Take care, however, as you will immediately find yourself in a big sacrificial statue guarded by several Heretics, including the boss at A, guarding the boss leveled chest at B. Two small detours to the northwest and southeast will net you a minor loot chest along with an encounter with a very accurate hunger statue trap (E), which can be deactivated through the nearby push block, and various alchemical loot (H) respectively. Head south, ignoring the metal door (it merely serves as an escape route if you fall down the Trapped Floor at K later on), and instead go up the stairs. Avoid turning left towards the bedroll at b as there is not treasure; instead, head right and claim the Madness Ore from the deposit at M. At the next intersection head right and make a difficult jump over the Trapped Floor at K to reach the boss leveled Urn at B. 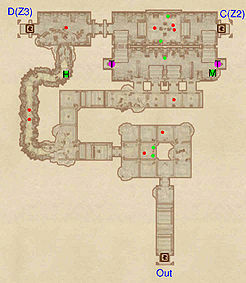 Finally, make your way through another ceremonial room and escape to Cann, The Great Hall through door D.
Upon entering from door E, ignore both root tunnels and head north, making sure to claim the minor loot underneath the bridge. The next room you encounter is the arena proper, the scene of the failed Elaborate Spectacle and home of past massacres, evident by the blood stains in the center of the lower level. Only three Heretics will patrol the area at this point and it is advisable to dispose of them now. In the northeastern corner, at J, a flawed sapphire and a flawed topaz can be found near a scroll explaining the frustration of the people responsible for the failed event. Open gate M and enter the Substratum through door G or I. NOTE: The chest at B, along with the boss-leveled Hunger (A) and three Heretic Mages will appear in the Arena after you explore the Substratum. When you return from the Substratum, new enemies will wait for you in the Arena, with the added bonus of the boss leveled chest at B. Backtrack almost to the entrance and head west into the root tunnel, looting the Amber limb at H and the rare Mute Screaming Maw plant at K. At the next intersection, head north to loot yet another amber limb. Before heading to the Halls of Tranquility, trek to the south and open the secret wall at L by activating the nearby push block (cyan dot on map) to claim two minor loot chests. The Substratum was the living quarters of the unwilling participants and you can find letters on their corpses, showing that they all thought it was to be a fight to the death, rather than the love-fest their captors intended. Make sure to explore all of the various cells as some of them hold some good loot. For example, you will find some chainmail pieces and three steel daggers at J and a full set of iron armor at H. Also at near J is the skeleton of one of the participants, still holding a Perfumed Letter. In the room just to the north you will find a tan robe and hood as well as the body of another participant, containing a Parchment. In the room to the northeast of J are some steel gauntlets and the rare tattered robe and hood. When you arrive at the trapped floor at T you can either fall down or open the gate at K to gain access to a minor loot chest and a Madness Ore deposit at M.